The Bluefin Tuna fishery has always been unpredictable from year to year. Sometimes we get a good shot at them as they migrate north and sometimes we don’t. This year is proving to be a good year as large to medium sized fish have been caught the last few weeks in the Hudson Canyon and just this week they are being caught in the 40-50 mile range. The regulations this year for possession limits are 3 fish from 27-46.9 inches and one fish from 47-72.9 inches per boat per day. For those of you waiting to catch tuna on a one day trip, now is the time. Capts Bernie Roth and Rich Oris hosted the Mark Lavery Charter from East Hanover in the Brett Bailey Shark Tournament on Saturday June 17. We started our drift in the Glory Hole and had no action till about 11am when the 40ft line went off and the charter fought a mako that measured 65 inches and was released in hopes of a bigger fish. Shortly thereafter the 40ft line went off again and the charter began fighting another mako that unfortunately spit the hook. Shortly after noon the 40ft line went off again and we could see this was a bigger shark. He took us around the boat up to the bow and then sounded. The charter fought the fish for over an hour and went through the six guys 4 or 5 times before he came to the boat and we could see he was tail wrapped and dead on arrival. The shark measured 88in and weighed 226lbs at Hoffmans. Marks crew has fished the tournament several times with us and this is the first time they did not have a single bite from bluefish, blue sharks or dogfish, just makos. It was a memorable day for them even though other larger mako sharks were caught and this was a winner take all tournament. Its official, the following are the regulations for 2017. Hosted the Chris Martin charter from Philadelphia for a day of Striper and Bluefish fishing. We started the day jigging fish under birds near Manasquan inlet and began catching jumbo Bluefish. When that slowed we put out the bunker spoons and continued to catch large Bluefish from Spring Lake to Belmar and back to Manasquan. The Striped bass did not make an appearance. 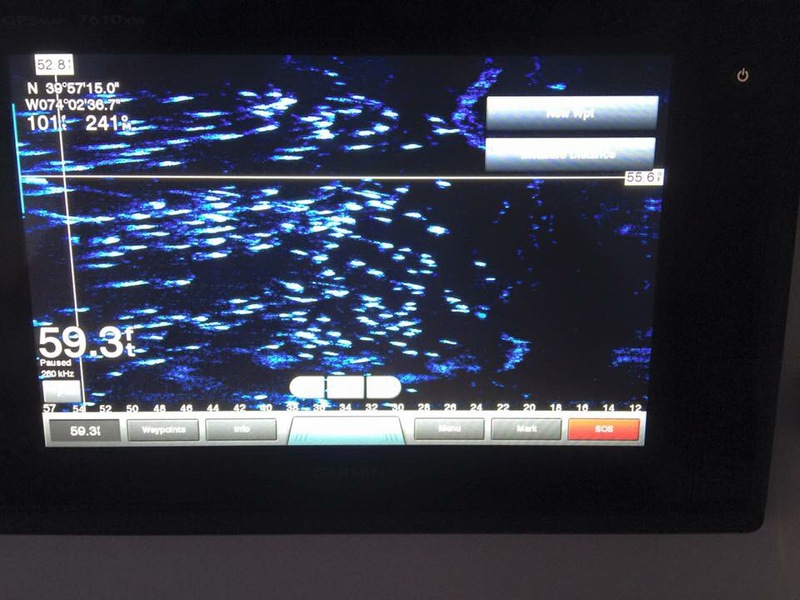 The Bluefish were so aggressive we were getting double header hookups on the two lines we were trolling. When all was said and done the charter landed 40 large bluefish. It was a rod bending day for the charter who had a blast. 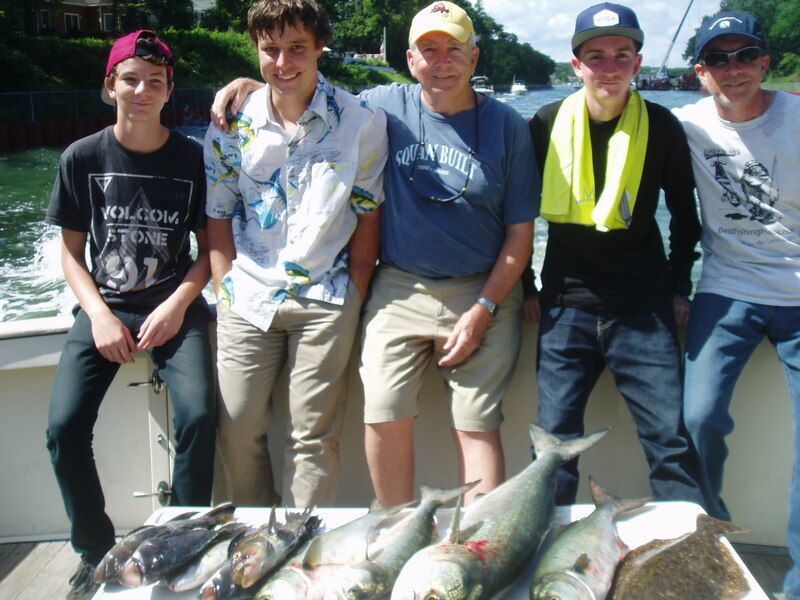 On Monday we hosted Stu Smith from Phoenix, Arizona, his grandsons and friend for a day of Bluefish and Fluke fishing. We ran to the Rocks and started trolling for Blues but could not get them to bite so we switched to drifting for Fluke which was equally frustrating. As the northeast wind began to ease we tried trolling again and we had more luck. The guys had 6 bites and landed 4 Blues. We switched back to drifting for Fluke the rest of the day and they had action with short fluke, sea robins, 4 Sea Bass, 1 keeper Fluke and a porgy. The weather was gorgeous except for the early wind and the charter was a great group to fish with. Stu will return next Monday with more grandsons and he put the pressure on me saying that group has to beat todays catch. I look forward to trying. We had the pleasure of hosting two fishing families on the weekend. On Saturday we had Sal Motisi with his family and friends who wanted Stripers and Fluke. We started in the Long Branch area drifting for Fluke and had immediate action with shorts and occasional sandsharks. We moved several times and each time we had constant action with shorts and finally caught one keeper. Although we did not encounter any bunker schools we trolled bunker spoons on the way home to no avail. Despite the lack of fish in the box the charter had constant rod bending and laughs on a beautiful day on the water.. It was a genuine pleasure fishing with both families. As the water continues to warm the Fluke fishing will continue to get better. Eric with 17″ fish at the Mantoloking Bridge on clam. With temps in the 50’s+ and calm sea the bass are literaly “jumping into the boats”. Three regulars reported non stop jigging and live line action from Spring Lake to Seaside Park. snagging and dropping again. We caught our under limit and went into release mode hoping for a 43 in over. We were releasing 35 pound fish as the action was incredible. We then caught a 44in 42lb slob for our only over. It was an awesome day and a great way to close out the season. Yesterday’s fishing looked like this.